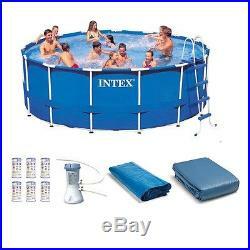 Intex 15' x 48 Metal Frame Swimming Pool Set w/ Pump and Filter Pump Cartridges. Part Number: 28241EH + 6 x 29000E. Above ground metal frame pool set. Set includes: Pool, filter pump, A-frame ladder, ground cloth, debris cover, and instructional DVD. The Metal Frame Set Pool is an affordable and easy to set up alternative to more complicated steel walled pools. Versatile and durable, the Metal Frame Set Pool provides both value and convenience. Intex's Frame Set Pools are ready to provide years of family enjoyment. The wall PVC material is Intex's super-tough, which is high molecular PVC unaffected by gasoline, oil, and salt water. Super-tough PVC is highly resistant to damage from abrasion, impact, and sunlight. At 15 feet wide, 48 inches in height and loaded with great accessories, the Intex 15' x 48 Metal Frame Set Pool is great for making a splash in the warm weather. Easy to assemble and maintain, this pool is great for hosting friends and family at an excellent value. Designed to last for years of backyard fun, this complete swimming pool set is sure to become a family (and maybe a neighborhood) favorite. Includes everything you need for a great pool experience, including the powerful Intex 1000 GPH filter pump (includes a Type "A" filter cartridge), 48-inch ladder, debris cover, ground cloth and installation/ maintenance DVD! Proper installation of any above ground pool requires an area, sufficiently larger than the desired pool, to be leveled flat. Uneven ground, hills or holes must be leveled before pool assembly begins. If severely uneven ground prohibits level ground, proper installation will not be possible. Also included is the 6-pack of Intex Pool Easy-Set Type A Replacement Filter Cartridges to keep your pool performing at its best. Constructed out of 13.5 square feet of high-quality Dacron, this filter cartridge was designed to keep your Intex or other compatible filter pumps running longer and stronger. Replace this filter cartridge every 2 weeks for peak performance. Intex 1,000 GPH filter pump is included to help keep your water sparkling clean. Also includes a Type "A" filter cartridge for the filter pump. Built-in GFCI (ground fault circuit interrupter) instantly shuts off pump if electrical current comes in contact with water making your swimming experience more safe. 48-inch A-frame pool ladder - a perfect fit for easy entry and exit from your pool. 15-foot pool cover and deluxe ground cloth keep debris out of your pool and protect its from dirt, rocks and general wear. Instructional and maintenance DVD also included to help you get started. Easy and conveniently drain plug accepts a garden hose to drain water away. Keep your pool sparkling clean and clear day after day. This filter also works for Summer Escapes type C filters. Dimensions: 4.25 x 8 inches. Intex is the world leader in both designing and producing high quality, innovative products for indoor and outdoor recreation. Intex above ground pools, pool accessories, pool toys, airbeds, and boats are known around the world for their tremendous quality and value. The item "Intex 15' x 48 Metal Frame Swimming Pool Set with Pump and Filter Pump Cartridges" is in sale since Tuesday, March 28, 2017. This item is in the category "Home & Garden\Yard, Garden & Outdoor Living\Pools & Spas\Swimming Pools\Above-Ground Pools". The seller is "vminnovations" and is located in Lincoln, Nebraska. This item can be shipped to United States.